This page is a guide that helps you get started using the Standardizer application. To get started with Standardizer, install the JChem package of ChemAxon firstly. For detailed instructions on the installation procedure, see the Standardizer Installation Guide. Once Standardizer is installed on your computer, you are ready to start your standardization procedure. 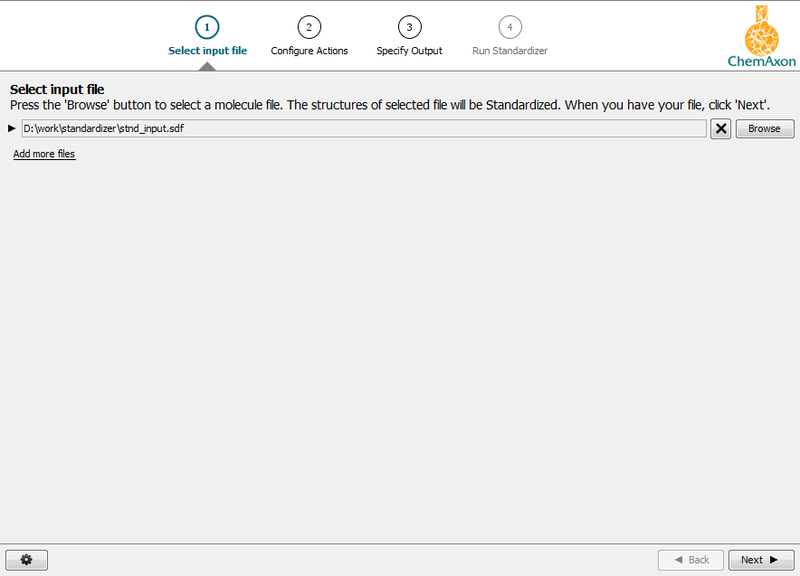 After launching Standardizer, you will be asked to specify your input file or files that contain the set of molecules you would like to transform. Learn about accepted file formats here. In the subsequent step, you can define the standardization rules (also called actions) you would like to apply on your molecules. 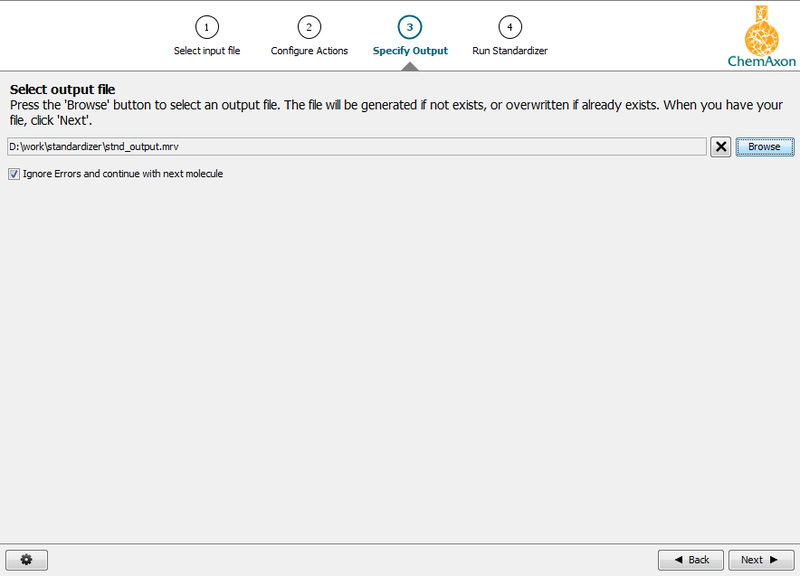 Simply move the desired transformation from the left to the right panel and modify the default settings if needed. To learn more about this step, visit Creating a Configuration Standardizer. 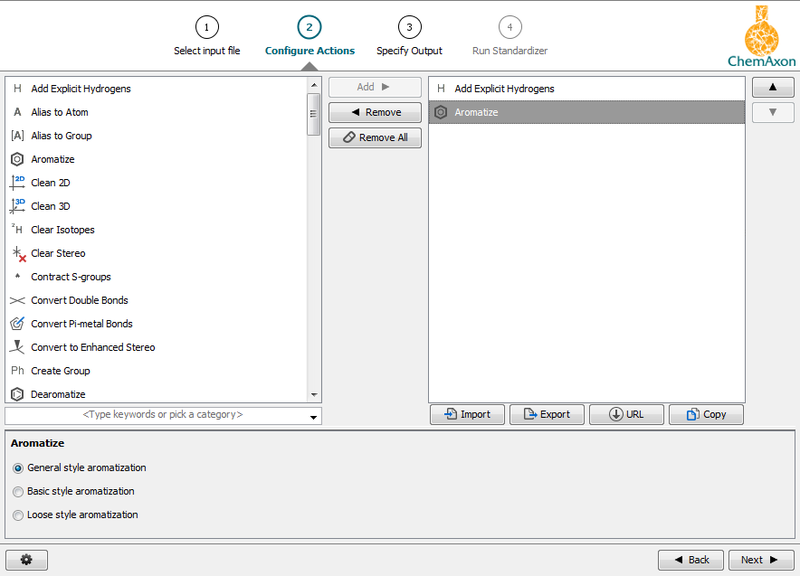 Then select the location of the output file that will contain the standardized structures. Besides entering its name, you can also choose from a wide range of file formats here. As you specified your input and output and selected the Standardizer rules to be executed, you are ready to start the standardization process by pressing the Run button. During standardization, you might see a preview of the processed molecules. When standardization is completed, a Summary sheet appears. 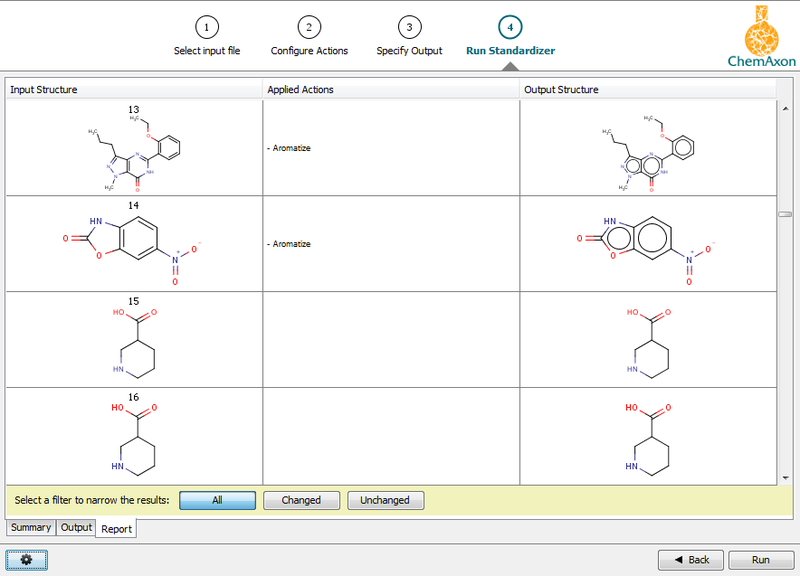 You can browse the Output tab to see your molecules in the standardized form. On the Report tab (see screenshot), the original molecules and the standardized structures can be compared and the applied actions are also listed. You can filter the list by clicking on Changed or Unchanged and a focused list appears displaying the modified or the unmodified structures, respectively. Standardized molecules will be stored in the given output file. Click here to read more about interpreting the Standardizer output! Visit Working with Standardizer to get more details on how to work with Standardizer!